Hop On: Feel the wind through your hair. Here, in a place some would call the most beautiful on earth, cyclists seem to fall into two categories: after-work mountain bikers, and those who don't seem to be employed at all. The sight of day-glo-clad groups of cyclists, their aerodynamically sculpted spandex butts in the air, is surely familiar to wine country drivers. And there must be thousands of miles of mountain bike tracks ripping up local park trails. But mostly these activities involve putting the bike on a car, driving it somewhere, then driving it back. And this isn't mentioning those who drive to the gym to ride a stationary bicycle. Fortunately, Bike to Work Day (May 16) has a lot more going for it than, say, Eat Your Brussels Sprouts Day. Not only is bicycling good for you and good for the environment, but people generally agree that it's an enjoyable recreational activity. Support for Bike to Work Day has been growing and growing. Steven Schmitz, who has run an "energizer station" in Sebastopol at the Joe Rodata Bike Trail head for the past seven years, says that while job-bound cyclists used to number about 15 to 20, last year saw more than 100. The energizer stations, open from 6:30am to 9am in at least 40 locations around Napa, Sonoma, and Marin counties, perform a "cheerleading" function, says Schmitz, who also heads the Sonoma County Bike and Pedestrian Advisory Committee. Volunteers hand out bags of goodies donated by BTWD sponsors and disseminate maps and useful cycling information. The stations and other events that make up Bike to Work Week are sponsored by RIDES for Bay Area Commuters, which is funded by the Bay Area Air Quality Management District. More bicycles, less pollution. Unfortunately, BTWD is held concurrently with Pollute Your Way to Work Day, an event of unprecedented success that has been held each day for nearly a century. The irony of the Lung Association's sponsorship of BTWD is that cyclists probably get a bigger dose of exhaust in their faces than drivers. As anyone who has ridden outside the protected domain of parks or quiet neighborhood streets can tell you, getting from point A to point B in the North Bay is not such a carefree lark. To the cyclist, the everyday routine of traffic transforms into a life-threatening world of hazards. Marked bike lanes suddenly disappear; pollution-belching vehicles whiz by your elbow; motorists blindly make right turns in front of you. The fatality statistics for bicyclists in this area are dismaying, among the highest in the state. The Sonoma County Bicycle Coalition hopes to change that with its Share the Road campaign, funded by a $200,000 state grant. The campaign, targeted at bicyclists and motorists, will eventually include billboards, radio, and bilingual information. Schmitz hopes that this year's BTWD will kick off the campaign and says he's excited about the next year and a half. Share the Road will address the issues of cyclist vs. motorist, hoping to bring greater understanding between the two that will allow them, well, to share the road. If this reporter were to bike to the Bohemian offices, he'd have to find side streets to get to the Luther Burbank Center, where the Bohemian is located. Mendocino Avenue, a road that passes through the center of Santa Rosa, numerous shopping centers, a high school, and one of the biggest community colleges in the state, has no bicycle lane. It's exactly this kind of squeaking one's way down the gutter of a busy street that puts a thorn in the tube of practical, everyday cycling. Joan Moulthrop of Santa Rosa's Transit and Parking Department, says that while there is no Mendocino route planned, in the near future bicyclists will have a lane on Santa Rosa Avenue all the way into downtown. To get an idea of other plans, and to find those elusive bike lanes, the city provides a detailed map. That in itself is a good sign. The Sonoma County Bicycle Coalition provides information on maps for other municipalities, as well. So put on that helmet, get in gear, and visualize lanes. 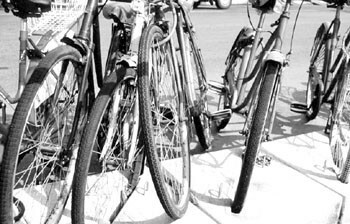 There are a lot of events to help you get going, including bicycle repair workshops in Santa Rosa and Sebastopol. Stop by the energizer stations and pick up a treat on the way to work. If enough people follow suit, the real reward may be far greater. From the May 16-22, 2002 issue of the North Bay Bohemian.